Oh what a beautiful day. I figure if it keep saying it maybe it will come true. But somehow I doubt it. The Big One has been struggling to get over scarlet fever since June. Well technically the rash is gone but the strep bacteria has been hanging on. Poor kid has been on antibiotics pretty much since her initial diagnosis on June 4. She stopped her latest dose five days ago. I thought we were doing good; usually about two days after she stops the antibiotics the symptoms re-appeared. Five days symptom-free was looking really good to me. I admit when she first started complaining, I ignored it because I had just seen a roach the size of Texas in my brand new bathroom. I was on a mission to find the Raid that I have been using to eradicate the ants. Since the Big One made it to the bathroom in plenty of time, I continued my search for the Raid. I found it, checked on the puking kid and headed back to my bathroom. Fortunately the big huge roach was still in there. I say fortunately because if that thing had disappeared I would have gone bonkers all day trying to find it. Okay, in real life the thing was huge!! So I took aim at the thing with the Raid. Now, I am not a screamer when it comes to bugs. I generally just squash them and move on. But as soon as I hit this sucker with the Raid it came after me. I freaked out. I squealed like a baby and started dancing around like I was walking on hot coals. I continued to spray the sucker and it continued coming at me. I kid you not I think I used at least half of the bottle of Raid to finally kill the darn thing. It was huge. Fortunately for me, while I was freaking out about the roach, the Little One was being a good little momma and was rubbing the Big One’s back as she continued to puke in the other bathroom. 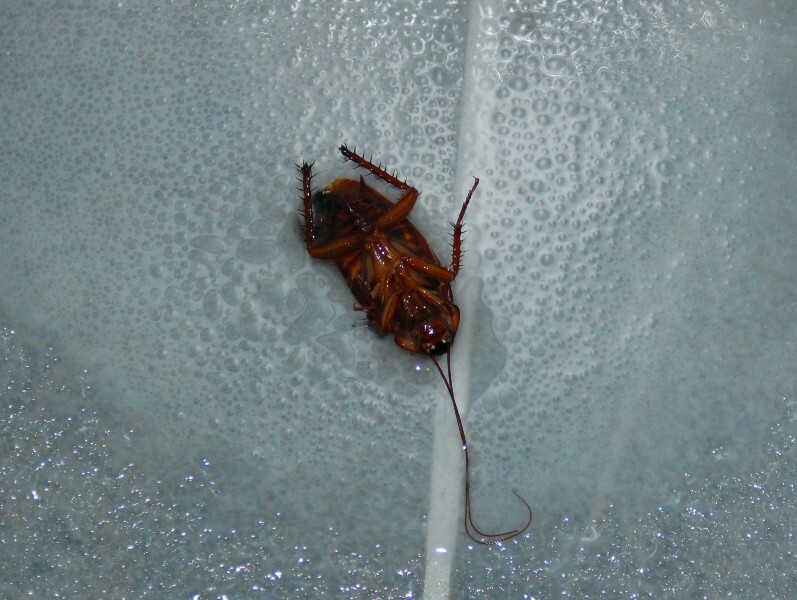 So now an hour later, the Big One is resting with a temp of 101.7°, the roach is dead, and I need to call the doctor yet again. At least since this will be the fourth time, – if it’s still strep – I hope we can get a referral to ENT. Oh MY, I had no idea your big one was ill. I vote for the badness to move on to a different family :D. hugs.. Hope everyone is well soon.